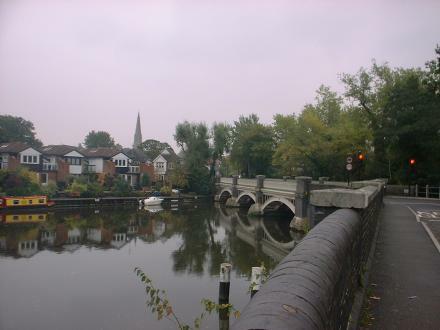 Weybridge Road Bridge is a minor waterways place minor waterways place place on the waterways major waterways place village town city on the River Wey Wey Navigation between Thames - Wey Junction (Junction of the River Thames and the River Wey. Weybridge town centre nearby.) (6½ furlongs and 1 lock to the northeast) and Woodham Junction (Junction of Basingstoke Canal with River Wey) (2 miles and 1½ furlongs and 3 locks to the southwest). The nearest place in the direction of Thames - Wey Junction is Thames Lock No 16; 4¼ furlongs away. The nearest place in the direction of Woodham Junction is Town Lock Weir Exit (Channel leading to the Weir); ¼ furlongs away. Off into town for meal. Portmore Way, Weybridge, KT13 8JD — 453 yards to the northeast. Towpath, Shepperton TW17, Shepperton, TW17 9LJ — 1299 yards to the north. 9 Hamm Moor Lane, Weybridge, KT15 2SB — 773 yards to the southwest. Old Heath Rd, Weybridge, KT13 8TX — 1322 yards to the southeast. 2 High Street, Weybridge, KT13 8AB — 576 yards to the east. 3 Balfour Road, Weybridge, KT13 8HE — 296 yards to the east. Weybridge Road, Addlestone, KT15 2QS — 1150 yards to the northwest. 1 Monument Hill, Weybridge, KT13 8RX — 838 yards to the east. Weybridge — 612 yards to the northwest. Weybridge — 1348 yards to the southeast. 40A High St, Weybridge, KT13 8BL — 663 yards to the east. 108-110 Station Road, Addlestone, KT15 2BQ — 1617 yards to the west. Heath Road, Weybridge KT138UE, Weybridge, TW138UE — 1399 yards to the southeast. 70 Church Street, Weybridge, KT13 8DL — 328 yards to the east. Thames Lock, Weybridge, KT13 8LG — 903 yards to the northeast. Locker 27 Hamm moor lane Weybridge trading estate, Addlestone, KT16 2SD — 803 yards to the southwest. Weybridge — 1286 yards to the northeast. 123 Station Road, West Byfleet, KT14 6DU — 1540 yards to the west. 27A Church Street, Weybridge, KT138 — 349 yards to the east. Pinehurst, Elgin Road, Weybridge, KT13 8SW — 320 yards to the east. 160 station road, Addlestone, KT152BD — 1449 yards to the west. 29-31 High Street, Weybridge, KT13 8BA — 696 yards to the east. Kibworth Harcourt — 1410 yards to the east. Investment House, 28 Queens Road, Weybridge, KT13 9UT — 1246 yards to the east. Station Rd, Addlestone, KT15 2 — 1388 yards to the west. Station Approach, Weybridge, KT13 8 — 1471 yards to the southeast. Weybridge — 813 yards to the east. 44 Church Street, Weybridge, KT13 8DP — 373 yards to the east. Addlestone — 605 yards to the west. Weybridge — 653 yards to the east. 1 Bridge Road, Weybridge, KT13 8XS — 294 yards to the southeast. Sunbury-on-Thames — 1315 yards to the northeast. The Mill Pond, Addlestone — 1095 yards to the southwest. Monument Green, Weybridge, KT13 8QJ — 805 yards to the east. Weybridge — 1304 yards to the east. 138 Station Rd, Addlestone, KT15 2BE — 1514 yards to the west. Weybridge — 1327 yards to the southeast. Weybridge — 1581 yards to the east. Addlestone — 1336 yards to the west. 6 gateway, Weybridge, KT138NT — 653 yards to the east. Heath Road, Weybridge, KT138UE — 1428 yards to the southeast. 1234 yards to the north. Churchfield Road, Weybridge, Weybridge, KT13 — 649 yards to the east. Heathside School, Brooklands Lane, Weybridge, KT138UZ — 788 yards to the south.